The Mafia Funeral was inspired by a true incident. 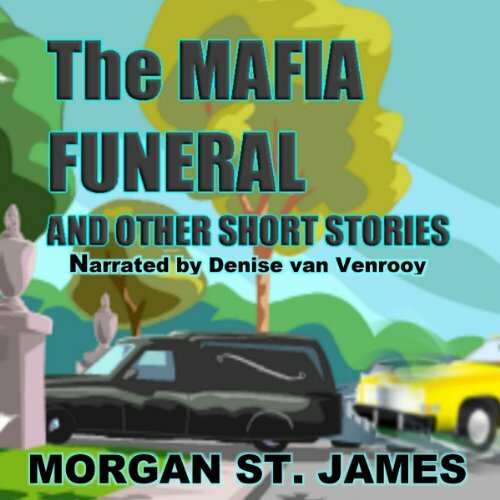 When Susan attends the funeral of a young friend whose father was in the Mob, what happens at the church is like a scene from a funny movie complete with an irate priest and five shocked Jewish pallbearers. Later a gangster from San Francisco mistakes her for the daughter of a Mafia mobster. You'll laugh at the funny stories, try to solve the mysteries and feel your heart warm to others. The collection includes several of Morgan St. James's award-winning short stories - some fiction - some true. This is the perfect audiobook to listen to when time is limited. If you could sum up The Mafia Funeral and Other Short Stories in three words, what would they be? I loved Saying Goodbye to Miss Molly, it was such a lovely story that had me getting emotional. Sometimes a good cry is cathartic. What aspect of Denise van Venrooy’s performance would you have changed? She has a nice solid read but it lacked variety. I would have loved it is each story felt different in the narration. There was a lot of opportunity to deliver a varied performance. She has a great pace that flows nicely but it lacked that extra bit that brings the stories to a new level. It could have been in one sitting but I did it on my commute, which really worked out. Each story fit nicely into my drive time and entertained from beginning to end. I would love to see more of this author, if these short stories are any indication she has some real skill as a story teller. I love short stories so it was no hardship or question that I would gravitate toward this title. And St. James has made a lovely collection here with stories that are skillfully written to bring situation, character and action clearly to the reader without great struggle. Each word is carefully placed and chosen to present the correct tone, definition and connotation to the story, creating subtext that clearly enhances each story’s voice. A mix of focus in this collection, this gives a solid feel for the author’s intent: from simple-appearing moment in the life stories to gentle tales with a romance leaning, they work together or stand alone without issue: always fresh, presenting clear imagery and voice. Narration in this story was presented by Denise van Venrooy and was a bit inconsistent for me. Not exactly right or wrong, her narration was consistent across all of the stories in this volume -a choice that did not allow for the variation in tone of each story’s voice that would have brought this narration from a simple reading into the arena of performance. While the stories are wonderfully adept pieces of writing that present the best of what this genre can be, I believe I will find the written version far more enjoyable. I received an AudioBook copy of the title from the author via AudioBook Jukebox. I was not compensated for this review: all conclusions are my own responsibility.